Bonding uses tooth-colored materials to replace missing tooth structure or hide cosmetically unappealing minor defects in a tooth — chips, discoloration, and even minor spacing irregularities. Bonding materials are called composite resins because they contain a mixture of plastic and glass, which adds strength and translucency. The composite actually bonds, or becomes one, with the rest of the tooth. Composite resins come in a variety of tooth shades for truly lifelike results. When bonding is done with a skilled hand and an artistic eye, it may be impossible to distinguish the bonded tooth from its neighbors. Though bonding will not last as long as a dental veneer, it also does not require the involvement of a dental laboratory and, most often, can be done without drilling of the tooth. I';s a particularly good solution for teens, who often need to wait until their teeth have finished maturing before choosing a more permanent type of dental restoration. Because it does not involve dental laboratory work, tooth bonding can usually be accomplished in a single visit to the dental office. Expect the whole procedure to take 30 minutes to an hour. 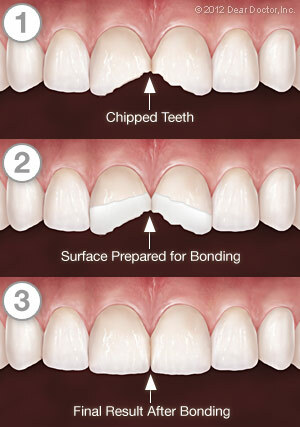 First, the surface of the tooth to be bonded will be cleaned so it is plaque-free. The surface will then need to be etched with an acidic gel that opens up tiny pores in the surface. After the etching gel is rinsed off, the liquid composite resin in a well-matched shade is painted on in a thin layer, filling these tiny pores to create a strong micromechanical bond. A special curing light is used to harden this bonding material. Once the first layer is cured, another layer is painted on and cured. Layers can continue to be built up until the restoration has the necessary thickness. 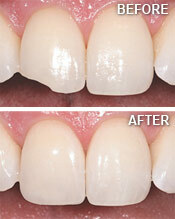 The bonding material is then shaped using a dental drill to give it just the right form. Once the tooth not only looks great but fits in perfectly with your bite, it will receive a final polishing.